My photography is terrible, and Visi-cat is unimpressed. If you can make it out despite my awful camera skills, that’s Liu Cixin’s THE THREE-BODY PROBLEM, R.S. Belcher’s THE SHOTGUN ARCANA, Beth Bernobich’s THE TIME ROADS, V.E. 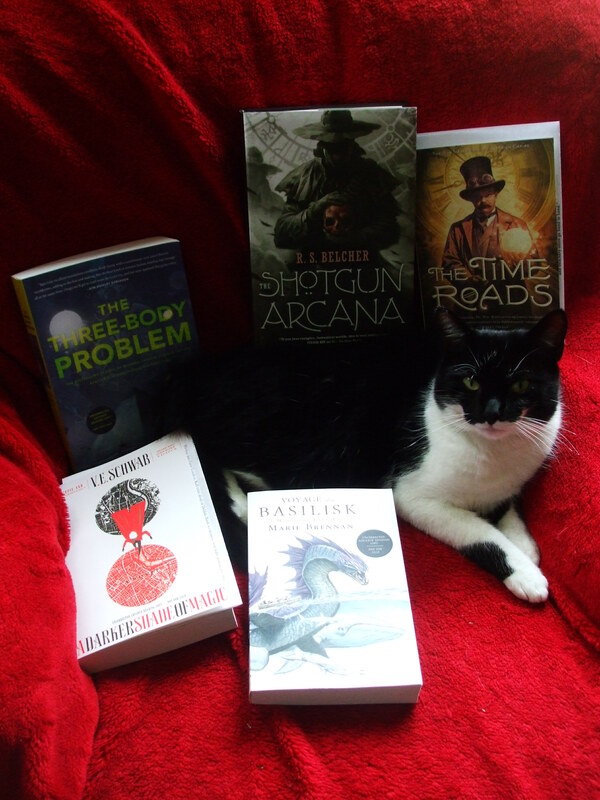 Schwab’s A DARKER SHADE OF MAGIC, and Marie Brennan’s VOYAGE OF THE BASILISK, about which I am very excited. 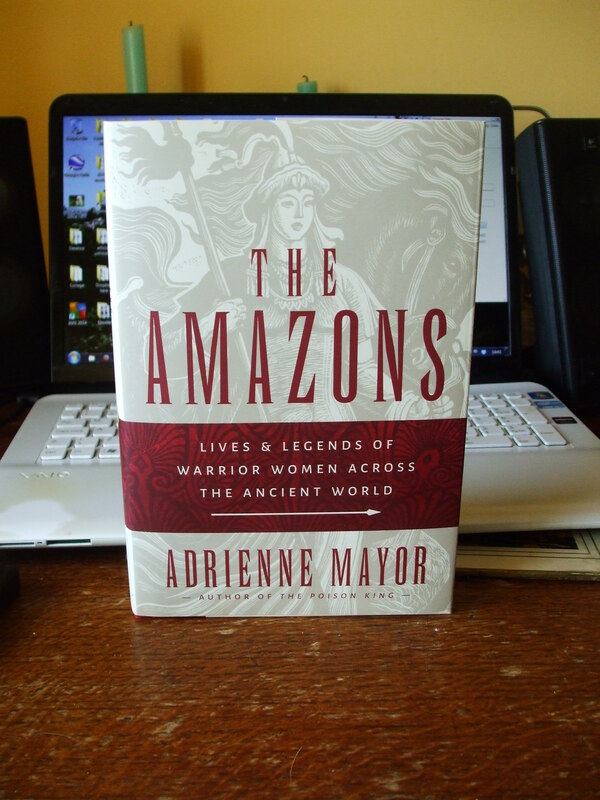 Review copy of Adrienne Mayor’s The Amazons: Lives & Legends of Warrior Women Across the Ancient World, via Tor.com. 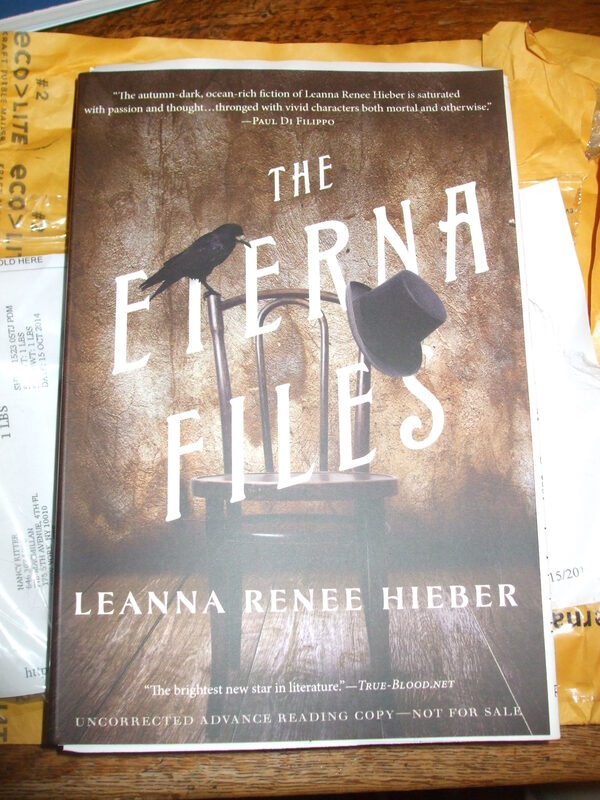 I am to review this for Tor.com, and I am positively gleeful about the opportunity to read it. Mayor is a researcher at Stanford who has a track record in publishing well-received popular history, and the cover copy for this book has strong praise from both Edith Hall (well-respected scholar of Classical receptions) and John Boardman (a name to conjure with for Classical historians), so I am very much intrigued to see what kind of book this is. Ancillary Sword: The all-piercing gun. Laurie R. King, To Play The Fool and With Child. Picador, 2014 editions. The second and third installment in King’s Kate Martinelli series. The interesting thing about these novels, I realised as I read her standalone books – discussed next paragraph – is how much more King is interested in character, in suffering, in relationships, than she is in the intellectual puzzle of whodunnit. Crime might be the frame, but it’s not the focus. Which makes these novels fairly powerful examinations of emotions and relationships and characters. Laurie R. King, A Darker Place, Folly, and Keeping Watch. Various publishers, various years. These are King’s standalone contemporary novels – though Folly and Keeping Watch are loosely connected – and it’s here where I noticed her concern with character rather than mystery most strongly. A Darker Place ends on an unfinished note, but it’s a study of one woman’s guilt and obsessions and drive, a drive that leads her into danger again and again; Folly is concerned with one woman’s struggle to rebuild her self and her life while struggling with a heavy burden of grief and mental illness – she’s a mother, a grandmother, an artist: her sickness places heavy burdens upon her relationships but doesn’t, ultimately, define her – while Keeping Watch is about how one man’s experiences in Vietnam (and his addiction to adrenaline) shaped his entire life. They are brilliant, fascinating novels, and well worth reading. Mary Balogh, One Night For Love, A Summer To Remember, The Proposal, The Escape, and The Arrangement. Ebooks. Formulaic historical romance. Diverting, but not really engrossing. Did not hit nearly enough of my narrative kinks. Catherine Asaro, Undercity. 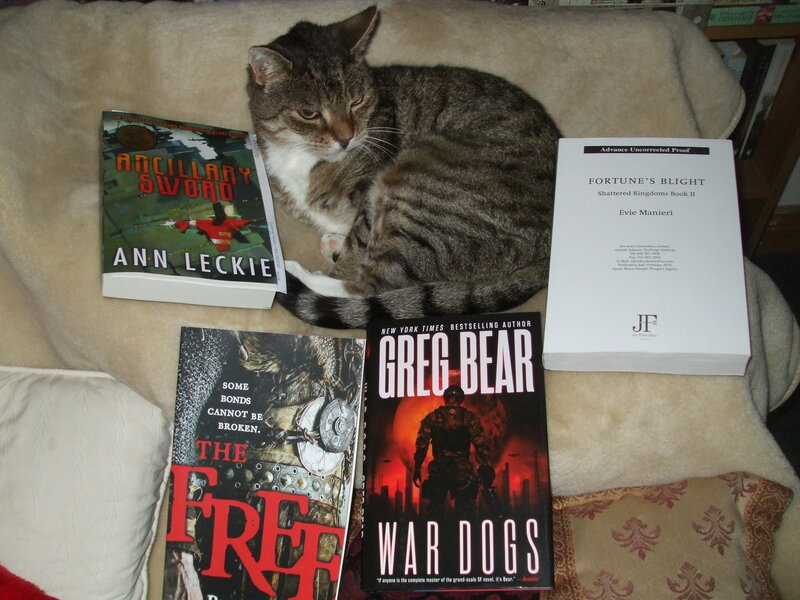 Baen, 2014. Review ecopy courtesy of the publisher. Read for review for Tor.com. My strongest feeling about this book is “meh.” It’s good enough, it does what it sets out to do, but it’s not stylish or innovative or particularly gripping. It has not enough flare and joie de vivre. I found it hard to say much about it in my review. Sarah Zettel, Palace of Spies. Harcourt Brace & Co., 2013. Read for inclusion in SWM column. An excellent and intelligent YA novel. Much recommended. Liane Merciel, Dragon Age: Last Flight. Tor, 2014. Review copy courtesy of the publisher. By far the best written of the Dragon Age tie-ins to date: it manages to tell a full and complete story without feeling like someone’s write-up of their roleplaying campaign, and does it smoothly. Interesting characters, solid BOOM. Would read more in this setting by this author. Gail Simone et al, Legends of Red Sonja. Dynamite, 2014. I said of Gail Simone’s first Red Sonja volume that it reminded me in the best possible way of Xena: Warrior Princess. Legends, a compilation collecting efforts from Simone and a variety of other authors, including Kelly Sue DeConnick, Tamora Pierce, and Marjorie M. Liu, feels very much like it too – without Xena’s levels of whimsical ridiculousness, but still. I really enjoyed this, and recommend it very much. Erin Lindsey, The Bloodbound. Ace, 2014. Red for inclusion in SWM column. Meh. Tone and concerns remind me a little of Mercedes Lackey or Tamora Pierce, though without their particular brand of… didactic feminism is not quite the term I need, but it may be close. Armies, threats to nations, heroine bodyguarding king. Briefly diverting, but not exactly compellingly great. Adam Clulow, The Company and the Shogun: The Dutch Encounter With Tokugawa Japan. Columbia University Press, 2014. A fascinating and immensely readable account of how the Dutch East India Company (the VOC) was stymied in its attempts to treat the Tokugawa Bakufu like the other nations and kingdoms the VOC succeeded in dominating in South East Asia. The VOC ended up, in fact, using the rhetoric of a vassal of the shogun, and being called upon to perform the duties of a vassal. It’s far from my period, but it feels like solid research – although I’d have preferred more emphasis on how the Japanese conceived of the Dutch. Judith Herrin, Margins and Metropolis: Authority Across The Byzantine Empire. Princeton University Press, 2013. A collection of essays on various aspects of Byzantine authority from across Herrin’s long career. Interesting stuff. 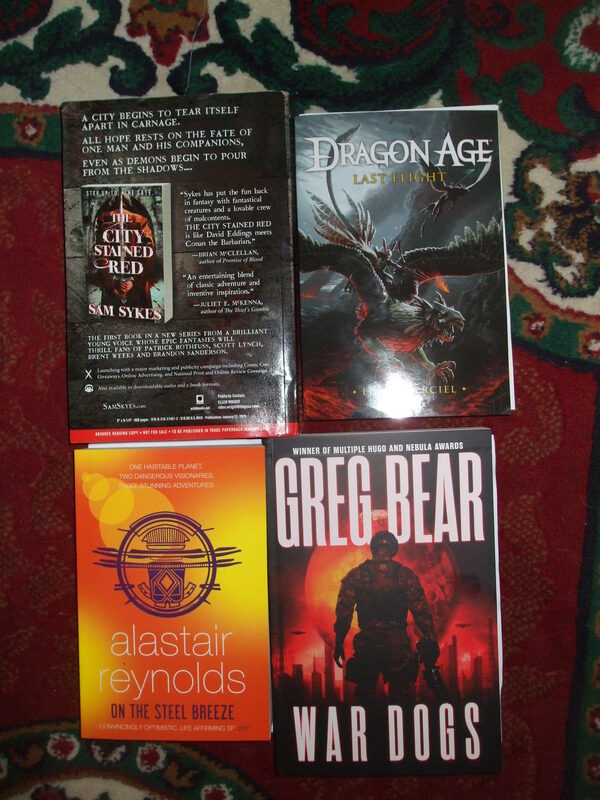 That’s Sam Sykes’ A CITY STAINED RED (Orbit); Liane Merciel’s DRAGON AGE: LAST FLIGHT (Tor); Alastair Reynolds’ ON THE STEEL BREEZE (Orbit); and Greg Bear’s WARDOGS (Orbit). It’s a truism that not every book is for every reader. Shadowboxer is Tricia Sullivan’s latest novel and first foray into YA, out now from Solaris Books’ Rebellion imprint. And it’s not a book for me. I may not have given it a fair enough shake. I kept picking it up, reading the first chapter, and wandering off. Eventually I managed to read to the end of the second chapter. But while it’s technically quite good, the protagonist and the voice aren’t anything I find encouraging to read: it turns out I have a very limited tolerance for cocky angry-violent protagonists with little apparent grasp of consequences. I thought this was just the case with male protagonists, but nope. Turns out it’s true for female ones too. They just have to come across a touch cockier and angrier. So this could be a good book, or not, but since I’m not being paid to finish it, I’m moving on. “The Real Amazon Warriors” discusses Adrienne Mayor’s survey of warrior women across the ancient world. Classical era poem found on stele in Western Turkey. Inscription dedicated to Hadrian in 129/130 CE uncovered in Jerusalem. Wooden statue of standing, dressed male figure preserved in bottom of well; uncovered during excavations under Agios Konstantinos Square in the Piraeus during works on the extension of the Athens metro. The article is in Greek, but Google translate appears to render a rough sense of it. Counterproductive, and yet I must make a request. There is a thing than has been annoying me for going on two years. It is undoubtedly counterproductive of me to discuss it, yet it has come to the point where I find it more than slightly irritating when it crosses the threshold of my attention. I want to put the question to you, dear readers. Is it a) vaguely creepy, b) more than vaguely creepy, or c) not at all creepy when an author appears to hold a public grudge over mixed review,* and continues to refer to it (directly and indirectly) at intervals as much as three years later? But I should not ask. The review in question was posted on Tor.com in the summer of 2011. Most recently well-meaning *cough* people have drawn my attention to the fact the author still seems to be dwelling on it. It is somewhat baffling to me, and I would like to request that well-meaning people in future not tell me these things. *Admittedly, I did email the bloke when it happened (because people kept telling me and tweeting about I’d called him a misogynist) to point out that this was a rather hyperbolic interpretation of my words. I was a baby reviewer and did not yet know better than to let the narrative burn itself out and not to worry about people’s possible insulted feelings over exaggerated interpretations. Perhaps there is a lesson to be acquired from that. Over at Tor.com. Ann Leckie was a delight to interrogate.